Google today announced it is retiring the previous release of Google Groups and launching a revamped version in its place, available immediately for all users. The updated service includes new management features, moderation tools, and a mobile site. One of the biggest additions is that Google Groups now lets you create an inbox for collaboratively sharing, distributing, and tracking responsibilities with multiple people. In other words, you get more control with less hassle. This feature gives you and a group of friends or colleagues a single point of contact for everyone you want to communicate with, but without having to create a separate new email account and sharing a password with everyone. All members of the group can manage emails, assign items to each other, and mark items as resolved. There are also several new moderation tools to make managing your forum easier and faster, including the ability to use canned responses. More importantly, the available options have been streamlined to make moderating forum posts easier, which should be a quick sell to your moderators. Last but certainly not least, you can now browse and moderate your groups on the go thanks to the newly added mobile site. This probably should have been added much sooner, given the rate at which smartphones and tablets are being snapped up, but better late than never. 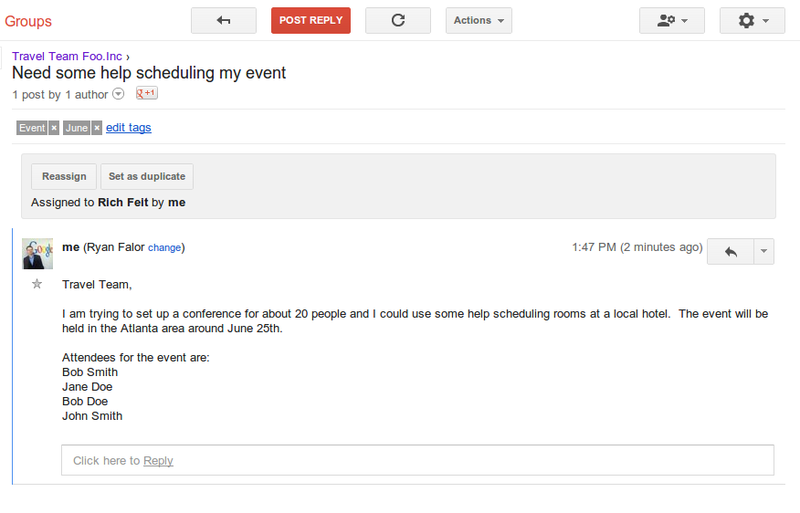 For those who don’t know, Google Groups is a free service that supports discussion groups with mailing list support. It launched as Deja News back in 1995, and was bought by Google in February 2001. This is probably the biggest revamp since then, and frankly it’s been a long time coming.